Received: September 17, 2013; Revised: November 3, 2013; Accepted: November 20, 2013; Published online: December 30, 2013. Xanthelasma palpebrarum (XP) presents clinically as yellowish plaques on the upper and/or lower eyelids. To date, several studies have reported on the therapeutic efficacies of ablative and non-ablative lasers for treatment of XP, including 10,600-nm carbon dioxide (CO2) lasers, erbium-doped yttrium aluminum garnet (YAG) lasers, 1,550-nm erbium-doped fractional lasers, pulsed dye lasers, Q-switched neodymium: YAG lasers, and 1,450-nm diode lasers. Here, we report on a case of XP effectively treated using the pinhole method. The pinhole method utilized a CO2 laser in order to make multiple small holes, which mimicked sweat pores on skin lesions. CO2 lasers are among the most widely available laser devices; therefore, implementation of their use in performance of the pinhole procedure for treatment of XP in Asian patients would be relatively easy and inexpensive. The pinhole method using a CO2 laser refers to a procedure in which multiple small holes mimicking sweat pores are made on skin lesions, such as burn scars and syringomas.7,8 Puncturing the targeted skin lesions with the pinhole method is easy to perform and results in less oozing and post-therapy erythema.7,8 Here, we report a case of XP effectively treated by the pinhole method. 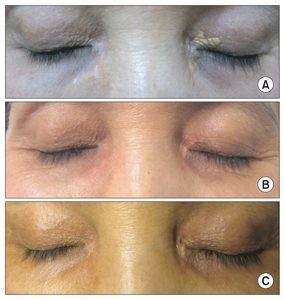 A 63-year-old Korean woman presented with yellowish plaques on the upper and lower eyelids that had slowly progressed over the past year on the left and the past 7 years on the right. She had no pertinent family history or medical history, except for essential hypertension and hypercholesterolemia, which had been treated with oral medications for over 3 years. Upon examination, yellowish plaques were distributed across the left upper and lower eyelids and the right lower eyelid (Fig. 1A). She had no previous treatment history of eyelid lesions. After being clinically diagnosed with XP and obtaining written informed consent, a single session of CO2 laser treatment using the pinhole method was undertaken. For local anesthesia, a topical eutectic mixture of 2.5% lidocaine hydrochloric acid and 2.5% prilocaine cream (AstraZeneca AB, Södertälje, Sweden) was applied to the lesions under occlusion one hour prior to laser treatment. The treatment parameters for the CO2 laser (SPECTRA SP™, Lutronic Corporation, Goyang, Korea) included a pulse duration of 200 μsec, a frequency of 50 Hz, a 0.04 on-time, and a 0.01 off-time. Multiple small holes deep to the mid-dermis at intervals of 1 to 3 mm were made on the yellowish plaques without remarkable immediate side effects, including bleeding, oozing, or blister formation. The patient was instructed to apply 3% ofloxacin ointment (Ocuflox, Sam Il Pharm, Seoul, Korea), as well as a moisturizer, to the treated area. One week after the treatment, the XP lesions were markedly improved (Fig. 1B). Post-laser therapy erythema almost disappeared within two weeks. Major side effects, including scarring, post-laser therapy dyschromia, and persistent erythema, were not observed. Most of the XP lesions were effectively treated and the patient was satisfied with the results (Fig. 1C). Nonablative laser devices have been reported to be effective in the treatment of XP lesions.5,6 Previously, Park et al.6 demonstrated the use of a 1,450-nm diode laser as a new, effective, and safe therapeutic option for XP. In their report, a 1,450-nm diode laser was effectively used to destroy sebaceous glands by administering a photothermal zone to the dermis at a depth of 100–500 μm.6 However, the penetration depths of individual laser devices are limited according to their device-specific wavelengths, and repetitive treatments are frequently required.2 Moreover, because nonablative laser devices are not widely used in many clinics, the cost-effectiveness of new laser devices for treatment of XP remains to be evaluated. We discerned that the therapeutic efficacy of our method may be related to the following: 1) the laser induced direct and indirect thermal destruction of foamy histiocytes, and 2) the laser induced transepidermal elimination of dermal foamy contents. Laser-induced transepidermal elimination has been reported in previous studies after CO2 resurfacing or nonablative 1,550-nm erbium:glass fractional laser treatment.9,10 Because only a limited portion of the XP lesions was treated with the CO2 laser in our patient, marked clinical improvement could have resulted from transepidermal elimination of the target tissues by the pinhole method. In conclusion, we suggest the use of the pinhole method utilizing a 10,600-nm CO2 laser as a new treatment modality in patients with XP on the eyelids. As CO2 lasers are some of the most widely available laser devices, their use in performing the pinhole method to treat XP in Asian patients would be relatively easy and inexpensive to implement. Additionally, the side effects associated with ablative laser procedure, especially post-therapy dyschromia and scarring in Asian skin, can be minimized. Nevertheless, further optimized, prospective studies should be conducted to confirm our findings. This research was supported by the 2013 Scientific Promotion Program funded by Jeju National University, Jeju, Korea. Fig. 1. (A) Yellowish plaques of xanthelasma palpebrarum (XP) on the left upper and lower eyelids and the right lower eyelid before pinhole treatment. Remarkably improved XP lesions on the eyelids at (B) one week and (C) one month after the pinhole treatment using a 10,600-nm carbon dioxide laser. Katz, TM, Goldberg, LH, and Friedman, PM (2009). Fractional photothermolysis: a new therapeutic modality for xanthelasma. Arch Dermatol. 145, 1091-4. Schönermark, MP, and Raulin, C (1996). Treatment of xanthelasma palpebrarum with the pulsed dye laser. Lasers Surg Med. 19, 336-9. Park, EJ, Youn, SH, Cho, EB, Lee, GS, Hann, SK, and Kim, KH (2011). Xanthelasma palpebrarum treatment with a 1,450-nm-diode laser. Dermatol Surg. 37, 791-6. Whang, SW, Lee, KY, Cho, SB, Lee, SJ, Kang, JM, and Kim, YK (2006). Burn scars treated by pinhole method using a carbon dioxide laser. J Dermatol. 33, 869-72. Cho, SB, Lee, SH, Lee, SJ, Lee, JE, and Kim, DH (2009). Syringoma treated with pinhole method. J Eur Acad Dermatol Venereol. 23, 852-3. Richert, SM, and Bridenstine, J (1998). Transepidermal elimination of elastic fibers after carbon dioxide laser resurfacing. A report of two cases. Dermatol Surg. 24, 275-8. Wang, CC, Huang, CL, Lee, SC, Sue, YM, and Leu, FJ (2013). Treatment of cosmetic tattoos with nonablative fractional laser in an animal model: a novel method with histopathologic evidence. Lasers Surg Med. 45, 116-22.